The Chill is the jail for Winterhold, located on an island north-northeast of the College of Winterhold and northeast of Septimus Signus's Outpost across the sea. If you are arrested by a Winterhold guard and sent to jail, you will be imprisoned here. The location of The Chill is not marked on the map; consequently, it cannot be selected as a destination for fast travel. There is only one zone, The Chill. It is located on a mineral rich island, with the ore veins listed below. The island is inhabited by several leveled animals in addition to a few horkers and can include; snow bears, snowy sabre cats and ice wolves. One of the animals is normally found near the corundum ore vein to the northwest and another is normally found near the iron ore veins to the northeast of The Chill, the animals and horker may end up fighting each other resulting in the victors being found injured near the dead casualties. Two gold ore veins among the rocks above the chill (see bugs). One silver ore vein to the southeast. Four iron ore vein three to the northeast and one on the far southern tip. One corundum ore vein to the northwest. The interior of the cave is guarded by a frost atronach. There are three cages with adept-level locks, each contains a bed roll and a further three small cages hang from the ceiling in the cave, which are all empty. There are skeletal remains in the two other cages on the ground, they can be looted. The third cage is the one you are sent to, it has a lit lantern on the floor. There are also seven food barrels in the cave. If you are sent here, then you keep all your equipment, including stolen items, making escaping the jail the easiest in Skyrim. Upon entering the Chill, regardless of whether you were jailed or entered of your own free will, the frost atronach inside and three others outside will all respawn. Upon exiting the three aggressive frost atronachs outside will attack you on sight. 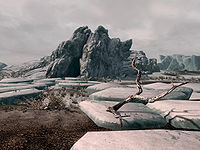 A map marker for The Chill was added by the Unofficial Skyrim Patch, version 1.3.1. Due to pathing issues, standing on / near the gold ore veins will prevent any hostile creatures reaching you and should allow you to fast-travel out of there. When arrested in Winterhold, if you choose to go to jail, the guards will respond with "Ha, enjoy the Chill." If you escape from the Chill, you do not incur the 100 gold bounty that you would normally receive from escaping jails in other holds. All the containers in the Chill (which are only barrels) are respawning, and therefore unsafe to store items in. You may not be able to interact with some of the ore veins. ? Entering and exiting The Chill again may resolve this. When entering The Chill from the outside, the cage you would be put in if you were arrested in Winterhold may not spawn, leaving the door floating in space. ?